I hope you had a beautiful weekend! I had a fabulous time with rehearsals, pinup cocktail party, teaching and a fully booked pinup workshop, among many other fun things. A new week is upon us with new adventures to be had. For this week’s Monday Morning Glamour inspiration I have for you decadent Jane Russell. 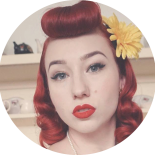 This entry was posted on July 10, 2017 by Miss Lady Lace in Monday Morning Glamour and tagged 1940's, 1950's, blogger, glamour, miss lady lace, miss lady laces pinup blog, Monday Morning Glamour, perth burlesque, perth pinup, perth pinup blog, perth pinup community, pin up, pinup, pinup blog, pinup blogger, pinup fashion, pinup girl, pinup life, pinup lifestyle, pinup perth, red lips, retro blog, retro girl, retro glamour, the perth pinup community, victory rolls, vintage, vintage blog, vintage blogger, vintage fashion, vintage girl, vintage glamour, vintage perth, vintage pinup blog.